Wrinkled clothes are the worst. They reflect the exact opposite of tidy, clean and neat. Perfect clothing that is impeccably ironed isn’t only necessary at work or during business meetings, but you already know that and unless you are the laziest person on the planet, you probably iron the clothes you are planning to wear. The only time when ironing becomes difficult and often impossible is during your travels. From garment bags to the wittiest packaging tricks, we have tried everything and we can assure you that no method will ever guarantee that your clothes will be wrinkle free. If you don’t want to take your home iron with you when you travel, there is only one option left: the travel steamer. A travel steamer is a lightweight, small device that works with steam, just like regular, professional steamers. It is easy to use and more importantly, it occupies very little space in any suitcase. Today’s steamers are a lot more functional and can be used by anyone. They are packed with nice features that will make your life so much easier. Are you looking for the best travel steamer on the market within your budget? Take a look at the five options below, consisting of the best-selling steamers these days. We have selected them out of hundreds of products and highlighted their pros and cons based on personal observations and consumer feedback. Today’s market offers so many options, that it becomes difficult to buy the best product at the best price. Once in a while, though, you can find products such as this one that offer value for money. PurSteam’s product comes at a great price and has features that will blow your mind. The manufacturer is a technology leader and has used a new steam channeling design on this product, which is why it delivers steam powerfully and evenly. It can be used to steam not only clothing, but also draperies, curtains and more. The steamer is made of durable components, such as the aluminum heating ball and ABS/PP. It takes 90 seconds for it to heat up and be ready to use. Giving its ability to steam any type of material, from linen to sequins, your life will become so much easier. You won’t have to keep looking for those temperature tags and you won’t worry about burning your clothes any more. Its water tank has a 6-ounce capacity. This means that you will be able to use it for 7 minutes. After that, it will need a refill. This product measures 3.7 x 8.6 x 7 inches inches and it weighs only 1.13 pounds. It is great for traveling and it even comes with a travel bag. If you are looking for a travel steamer with a larger capacity, we recommend Beautural’s steamer. This is a handheld model with 1200 Watts of power, which makes it one of the top choices of pretentious customers. The more power, the better the results; By comparison with the previous product from PurSteam, this one preheats in only 30 seconds, it has a water tank capacity of 8.79 ounces and can be used for 15 minutes continuously with that amount of water. Using it is completely safe, yet you have to hold it in a standing position while steaming. It has a great design, it is leak-proof and it has the feature that everyone is looking for: it steams even when clothes are laid flat. This model automatically shuts down after 8 minutes of inactivity or in case it overheats. It can be used for all types of fabrics, including sofas, curtains, toys or table cloths. Its water tank is removable, which also makes it easier to use. The soleplate of this product is made of stainless steel. It has a cord length of 7.8 feet and it includes 3 removable attachments: a fabric brush, a lint brush and a creaser. It also includes a measuring cup, which makes it easier to fill the tank. This device measures only 6 x 4.3 x 10.7 inches and weighs 2.09 pounds. Although it is heavier than the previous product, it is packed with awesome features you can’t say no to. On top of that, it is covered by a 2-year warranty. Sometimes, power and performance are not enough. If you are looking for a steamer that uses the latest technology, but is also stylish and has a gorgeous design, this is your to-go product. iSteam has done a very good job developing this steamer that heats up in only 25 seconds and works for 10 continuous minutes. Thanks to its spill proof technology and automatic shutdown function, it is safe and comfortable to use. This product is suitable for all kinds of fabrics, including curtains and sheets. Maintenance-wise, it is one of the most convenient products out there, as its Nano Polymer Filter prevents calcification inside the tank. Practically, you don’t have to do anything, except for cleaning its exterior when necessary. Thanks to its 360 degrees technology, you can steam your clothes from any angle. It will not spill or leak. Its most important feature is also the reason why most consumers chose this product. It is a multi-functional steamer that can not only iron your clothes and other types of fabrics, but it is also capable to clean, sanitize, treat and refresh. For instance, if your furniture and carpets are dirty, you can use this steamer to clean them. Also, if you want to refresh your linens, all you must do is spray a little steam on them using this product. It is great for traveling, as it only weighs 1.2 pounds. It has a 4.1-ounce capacity, which is more than enough for your needs during a trip. The steamer is covered by a 1-year warranty and includes a free detachable de-dusting brush. 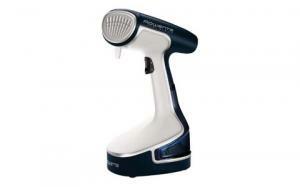 Rowenta is a manufacturer that built its reputation around high-quality home and beauty products and the DR8080 model is no exception. 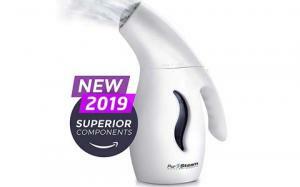 If you are ready to pay a slightly higher price for a steamer that is as powerful as any regular iron, then this is one of the best options for you. 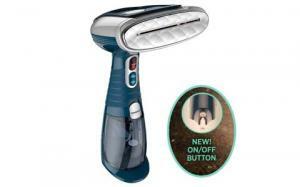 It has 1500 Watts of power and it is more than your average vertical steamer. It has an extra-large micro metal steam head with holes that is meant to distribute steam perfectly throughout the surface of the fabric. When using Rowenta’s DR8080, wrinkled clothes are no longer a reason for concern in your everyday life. It takes 45 seconds for this steamer to heat up and be ready to use. It can be used for 10 minutes continuously on any type of fabric. It comes with 3 accessories: a fabric brush, a lint pad and a steam bonnet. Thanks to its 3m cord, you will have the flexibility you need. It comes with a stable base and a stopper that allows you to even place it on the back of a chair when done using it. Besides being the most powerful steamer on the market, it is also a multifunctional product that is capable of refreshing and sanitizing your fabrics. It is heavier than most similar products on the market, weighing 3 pounds and measuring 13 x 5.6 x 8.1 inches. However, it is small enough to fit in your suitcase. If you are one of those pretentious people who want their clothes to look impeccable and a single wrinkle can ruin your mood, then you surely need more than just the average steamer for your clothes. If you also travel a lot and you need a compact, great-looking product that fits the small space of a suitcase, then this is what you are looking for. This product comes with a lot of great features, but these are reflected on its price, too. Although it is the most expensive product on this list, it is totally worth your attention. 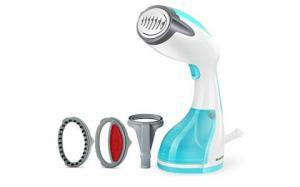 Conair’s ExtremeSteam has an advanced steam technology that allows it to reach temperatures with 50% higher. Also, it delivers more steam, which means that your clothes will be ironed much faster. It takes about 40 seconds for this product to be ready to use. It has a water container with a capacity of 7.3 ounces, a quantity that will suffice for approximately 15 minutes of continuous use. It comes with 3 attachments that can prove to be very useful: a silicone band, a delicate fabric spacer and a bristle brush. The silicone band makes it easier to steam by pulling fabric taut, while the fabric spacer helps protect fragile fabric. What makes this product so great is the quilted aluminum steamer plate, too. Thanks to these features, your clothes will look freshly ironed and pressed every single time. The ExtremeSteam uses 1550 watts, it measures 13.6 x 8.8 x 5.6 inches and weighs 3.1 pounds. The great thing about travel steamers is that they are much lighter and smaller than regular ones. Although they aren’t as small as many people tend to think, the difference is still huge. One general downside is that they don’t include hangers or other accessories that would occupy a lot of space. However, you can find a basic hanger in any hotel or rental. The second great thing about these products is that they use new technologies to make them more powerful than before. Although they can’t reach a professional steamer’s pressure, they manage to do the job they were built for just fine. Using a travel steamer is a breeze. You just have to plug it in if it is a corded one, wait for a minute or so and start steaming any type of clothing, from satin to wool. Counting on the hotel or host’s help to iron your clothes is an option, but it isn’t as inconvenient as having your own steamer. Especially in crowded hotels, you will often find that people wait in line for irons and other similar accessories. Therefore, chose your travel steamer and rest assured that you will be wrinkle-free throughout your vacation.